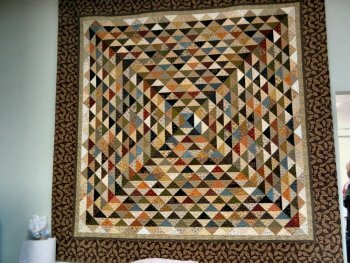 To keep is simple and standardized, we'll make the triangles using Laundry Basket Quilts 2 " Half Square Triangle Paper. The paper packets sell for $10.99 each. Each package contains 25 sheets’, which makes 700 half square triangles, simple to sew, accurate to cut, and effortless paper removal. For purposes of the exchange, just use half of the package or 13 pages x 28 per page equals 364 units. That should be plenty to get you going on the project of your choosing. Your triangle exchange units will be 2 inch finished. Don't use steam on this paper, it might distort. Press before sewing using "Best Press" and a dry iron. You'll sew your HST's and cut them apart. Do not press or take off the paper. LEAVE THE PAPER ON! Be sure to shorten your seam length to about half of what you would usually stitch. The two fabrics should be right sides together and the paper should be on the light fabric. So, cut a strip of fabric a bit larger than the width of the paper. Place the dark strip right side up, place the light fabric right side down. Place the paper on top. Use a presser foot with an open toe so you can see the needle piercing the fabric. That way you will know when to turn the corner. Follow the sewing and cutting lines on the paper. We like Aurifil thread that lays flat in the seam. We also like using a Microtex sharp needle, size 80 for stitching through the layers. Use one medium/dark and one light for your two sides. Use prints, batiks, shirts, tonal’s, no solids, quilt shop quality fabric for this exchange. The value is more important than the print here. It’s the contrast between lights and dark (or medium and light) that will make the most interesting quilts. 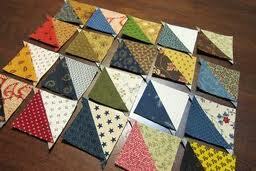 Sew your 13-paper/fabric sheets and cut them into the 28 half squares triangles per page. You will have 364 when done. Please don’t press or cut the paper away, just cut the units and put them into 13 bags of 28. Put your name and email on the bag with a label of some sort and bring them to the shop on or before September 21st. We’re giving you two months to sew up your scraps into HST’s. That’s just about two per week. You can do it. Once all the sets are collected, the shop will mix them up and you will receive back 13 new bags of 28 HST’s. If you plan on making a larger project, go ahead and sew up the rest of the 12 sheets in your packet but keep those for yourself. For purposes of the exchange, just bring back 13 sets of 28. Are you ready? Let’s start sewing. 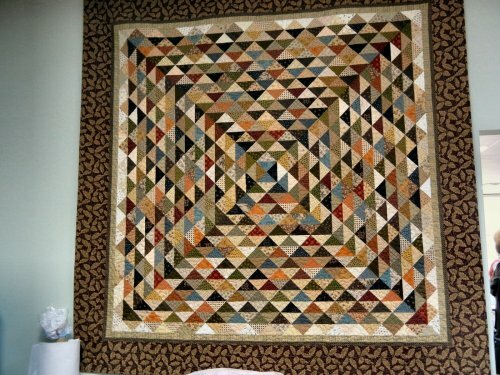 Please stop by the shop to pick up your 2 inch finished HST paper by Laundry Basket Quilts. The packets cost $10.99 and that’s all we’re asking to participate in this exchange. Get into your stash and you’ll be amazed at what you’ll be able to come up with. Thank you for your participation in the exchange. 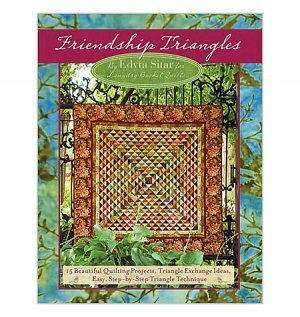 Some great project ideas using the HST’s can be found in Edyta’s book, Friendship Triangles.